SereneLife SLFTRD18 is a folding compact electric treadmill with an efficient yet quiet 1 horsepower motor and a smart LCD display panel with convenient touch button controls. It is a very recent release fitness equipment with only two customer reviews at the moment on Amazon.com but is rated 5 stars which is an indication of satisfied customers. You can download the iFitShow workout application for connecting to smartphone, tablets (Android and iPad) and computers wirelessly via Bluetooth 4.0 BLE without needing a password. The iFitShow app can be used on both iOS and Android and is connected to the HealthKit to gather and save the exercise data. And you can easily share your fitness and health info via Facebook, Twitter or Instagram. You will need to assemble it after taking it out of the box but it normally shouldn’t take you long- more like 15-20 minutes with the easy assembly instructions and tools. It will even be better if there is someone at home helping you in the process. It has an easy to set-up and operate electric plug-in design. And you have the integrated grip sensors on both handles that are connected to the small digital LED-backlit display with the usual training stats like distance, time, speed and calories. SereneLife Treadmill has the preset training modes that you can choose from for what you’re in the mood for on the day. And you can increase the exercise intensity by increasing your speed. You can turn off the power immediately with the red emergency shut-off button and a built-in security key on the display panel. So you shouldn’t worry about your security, it will shut off instantly in case you drift back or fall suddenly. But you need to attach the cord to your clothes. 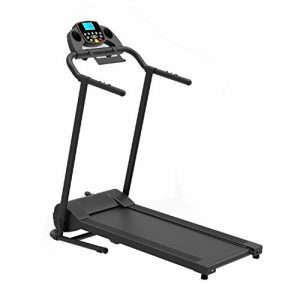 The motorized electric treadmill has a 1HP motor (100-120V power supply) that helps the unit run smoothly and quietly at speeds between 0.6 to 6 miles per hour. It is good for a great cardio workout for burning calories and fat, losing weight, building stamina and endurance, keeping fit and healthy overall. There is even a conveniently located detachable tablet and book holder that you can use during your workout to keep entertained and to be able to jog or run longer without getting bored. The exercise belt of 39.3 x 13.4 inches is not too bad and should be fine for most people except for the very large adults. It weighs 57.3 pounds and and has the user weight capacity of 265 pounds, measures 27.5 x 24 x 51.2 inches as assembled and 49.6 x 24 x 51.2 inches as folded. It is perfect for those that lack space in their small apartments and want to exercise whenever they want. The treadmill is compact in size and you can fold it when you’re not using it. It is good for walking, jogging and running in the comfort of your home and getting and keeping fit and offers good value for money overall.